“A game of two halves” is a much overused cliche, used in any match that doesn’t strike a perfect balance around half time, but for once, it was the perfect description of an enthralling match at Villa Park yesterday. With Villa coming into the match on a four game winning streak, Agbonlahor passed fit, and John Carew laying in wait with memories of being an Arsenal nemesis back in his Valencia days, there were plenty of reasons for concern. Even though O’Neill’s side haven’t beaten Arsenal in many years, I’m old enough to remember that before that, Villa Park was an unhappy haunt. With both sides showing attacking verve, it was to no-one’s surprise that the deadlock took so little time to be broken. Flamini gave the ball away in midfield, Carew whipped a good cross in from the byline, and the ball fell kindly to Craig Gardner, in for the suspended Reo-Coker, and he lashed home. 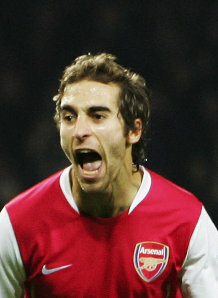 The goal seemed to spark Flamini into action. Playing a more advanced role alongside Diarra than he normally would with Cesc, he was getting forward with regularity, and when Eboue’s cross was touched back to him by Rosicky, he smashed the ball past Carson with immense power. For ten minutes, Villa were shellshocked, Hleb was pulling all the strings in some stunning interplay, and Alan Green was running out of superlatives on Five Live, save for another tiresome dig about the lack of Englishmen in the team. The inevitable turnaround was complete when Sagna’s looping cross was headed home from the penalty spot by Adebayor, an excellent finish given the close marking of two defenders. By half time, it should’ve been three or four. One potential weakness of this Arsenal team is that they rarely come out from half time with the same vigour, if the first half went so well. And combined with some extra bite from the Villa players, that made for an entirely different second half. Carew hit the bar with a header, Almunia made a couple of good saves and we posed little to no goal threat of our own. The real Villa, so improved under Martin O’Neill, had returned. But with it, so had Arsenal’s determination, organisation and sheer will to win. Under pressure, even more so after Hleb had to depart following Carew’s appalling challenge, they defended stoutly and held on to the win that the first half performance deserved. Hleb’s injury was another worry ahead of Wednesday’s game with Newcastle, although the Belarus star seems to be able to recover quickly from knocks, which is just as well given how many times he’s been on the end of brutal ‘tackles’ this season. Elsewhere, Lehmann refused to warm up with the team, or speak to Almunia, a situation the Spaniard describes as preferable. Quite frankly, with his behaviour, I’d be in favour of sending Jens down to the reserves and putting Fabianski on the bench. If he hasn’t already got the message, that should do the trick. He’s been a wonderful servant to the club, but the way he’s reacted this season has been nothing short of disgraceful. But another test was passed this weekend, another match where two facets of Arsene’s latest incarnation were prominent. This proves to be a tough week, but yesterday’s result may just finally convince the pundits that we’re in for the long haul. And, amusingly, former Gunner Seb Larsson scored an absolute screamer in injury time this afternoon, to give Birmingham a shock win at White Hart Lane. Where are those predictions now?